The 32 acre (13 hectare) reserve is divided into six areas starting with meadow at the southernmost edge and changing progressively into broad-leaved woodland to the North (on the right of the above picture). The whole of the area is bound by a ride on the eastern side, which makes access to each area quite easy. Quoditch Moor Nature Reserve is now under the ownership of Lucien Douglas-Green and before that has been under the family ownership since 1997. For further information and permission to access the land please contact Lucien on 07854 832036 or e-mail him at lucien@quoditch.org.uk. The aim is to run the site with an emphasis on conservation and education which is why we are gradually building up this site. Contributions to enable us to identify any species found are always welcome. Quoditch Moor Nature Reserve is a prime example of Culm Wet Grassland, much of which has disappeared over the last few decades. It is available for study by private visitors and educational parties by prior arrangement. IT IS NOT OPEN TO THE GENERAL PUBLIC, NEITHER IS THERE ANY PUBLIC RIGHT OF WAY ON THE LAND. We are trying to record as much about our land as possible, but there are lots of things that we cannot identify, even though we have built up a copious reference library. Please take a look at our "What is this?" page and let us know if you recognize anything. The land receives grants from DEFRA under the Countryside Stewardship Scheme. Acknowledgment must also be made to Devon Wildlife Trust for its efforts over the years to bring about public awareness of the need to preserve Culm Grassland. 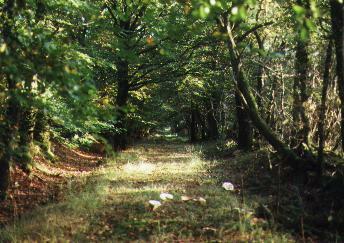 Quoditch is affiliated to the British Naturalists' Association.